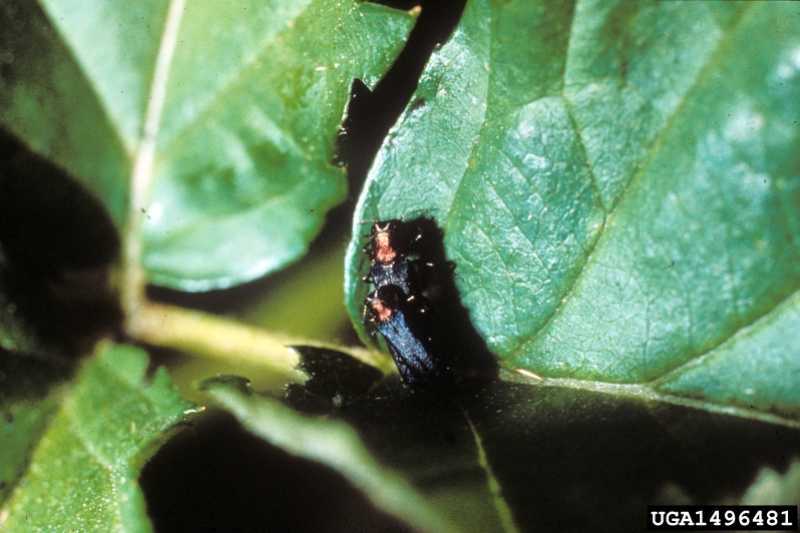 Two different cane boring beetles, raspberry cane borer and red-necked cane borer, can cause damage on brambles such as raspberry and blackberry. 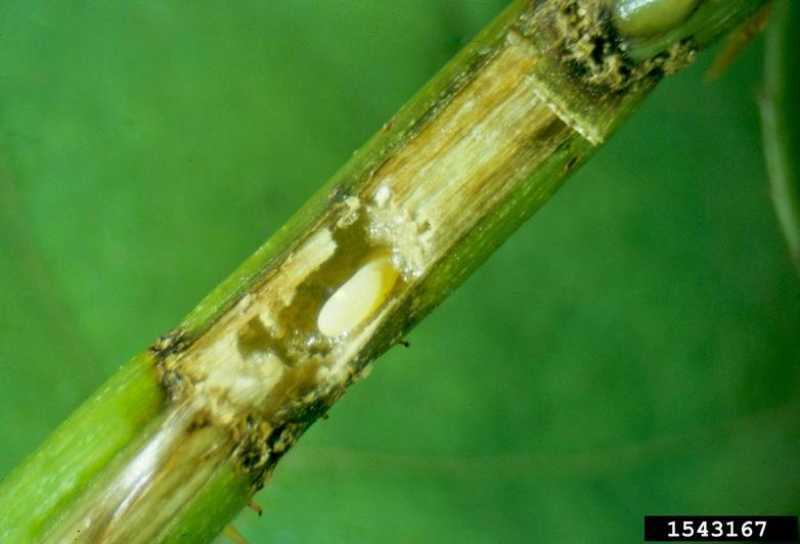 Occasionally, the raspberry cane borer may also cause damage on roses. 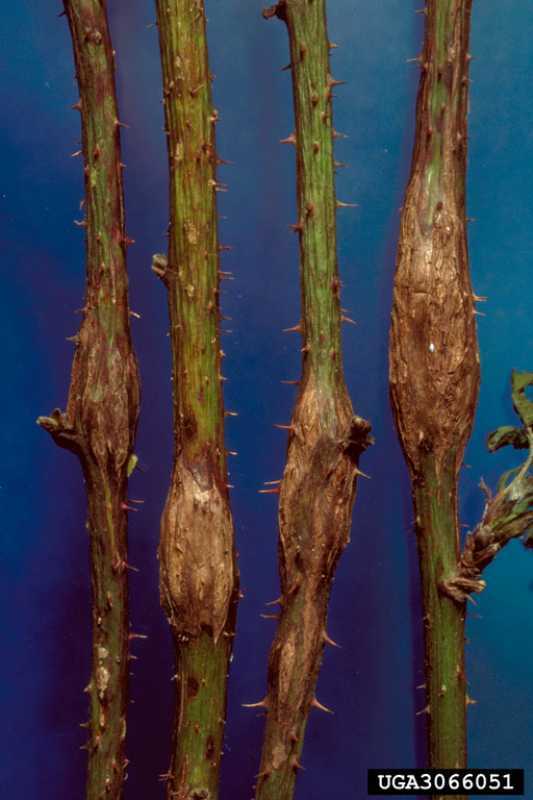 RASPBERRY CANE BORER: Twigs are girdled causing younger shoot tips to wilt and eventually die. The bases of girdled areas show a purple discoloration. 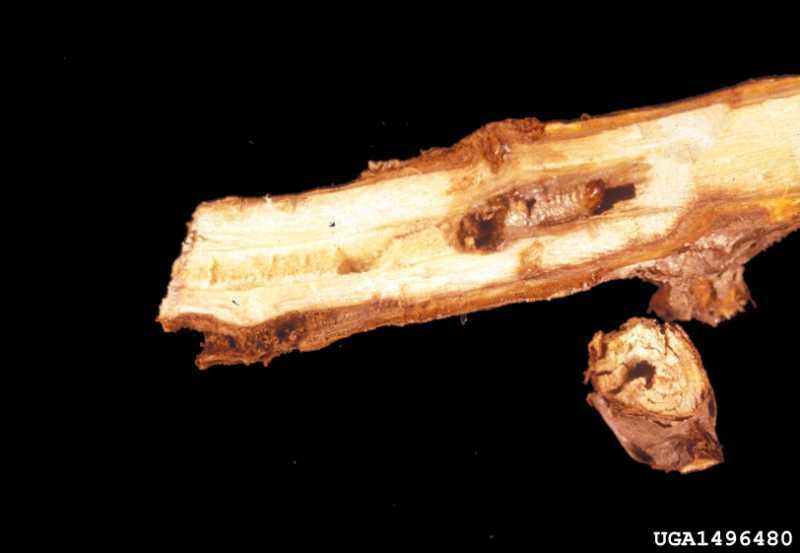 RED-NECKED CANE BORER: Random areas on branches may become swollen or enlarged. These areas can be several inches long and at least 1/2 inch diameter. Sometimes branches may break off where swelling has occurred. Holes in leaves caused by the feeding of the adult beetles should also be evident. RASPBERRY CANE BORER: Raspberry cane borers, Oberea bimaculata, are long-horned beetles. Their black bodies are about 1/2 inch long, and they have prominent antennae that may be as long as, or longer than, their bodies. They have a yellow prothorax with two black dots. Adults emerge in June. Females will insert single eggs into punctures that they make in the twigs; twigs may be girdled above and below these punctures. Larvae girdle the trunks from the inside and remain to bore downward through the trunks for two winters before pupating and finally emerging as adults. RED-NECKED CANE BORER: The red-necked cane borer beetle, Agrilus ruficollis, has a blue-black metallic body with a copper-red thorax. Females lay their eggs on the bark of the canes, near the base of a leaf. The white grubs are 1/2 inch long and can be found feeding within the canes, near the swollen and discolored areas. Adult borers can be found feeding on the foliage in late spring or summer. There is one generation per year. 1. Prune all canes that show signs of infestation. 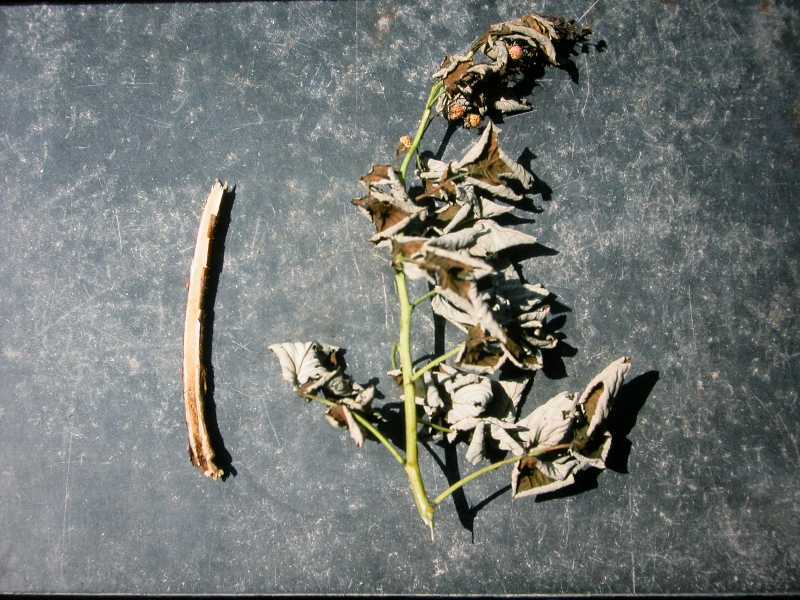 If you prune after wilting first occurs, you only need to prune about an inch below the wilted part; if you wait to prune a wilted cane, a longer cut must be made to insure that you remove the feeding larva. Prune girdled canes the first winter after observing damage in order to kill raspberry cane borer larvae. Otherwise, they will continue to feed and bore through until they have completely destroyed the cane and reached the ground to pupate the next winter. 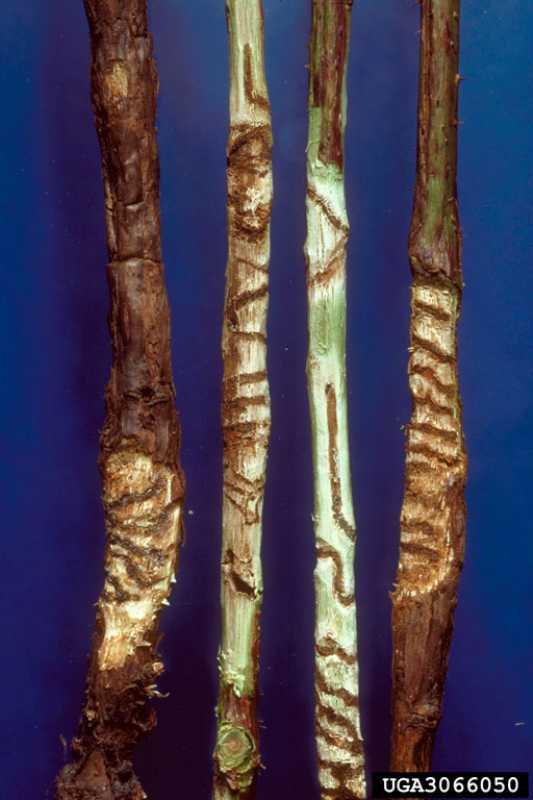 Remove canes after red-necked borer damage has been observed by late spring the next year so that adults don't get a chance to emerge. 2. Destroy any wild brambles that may be bordering your property. They may also be hosting cane borers. 3. Apply insecticides. Both adults and larvae can be controlled with insecticides. Apply an approved insecticide when adult beetles are most active prior to bloom in order to achieve the most success. If needed, apply a second spray once petals have fallen. 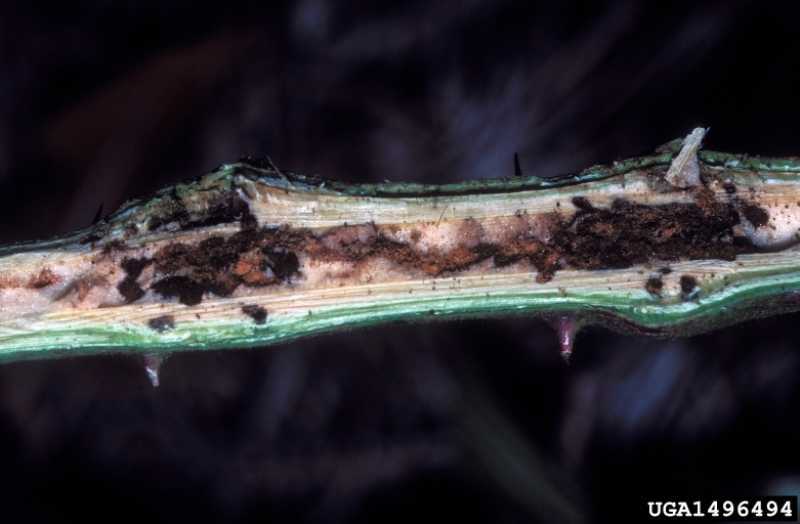 Spray or paint trunks and branches of infected bushes with pyrethrins so that larvae are destroyed before they have a chance to burrow into the wood. Strategies 1 and 2 are strictly organic approaches. For an organic approach to Strategy 3, consult the Organic Materials Review Institute (OMRI™) for appropriate pyrethrin products.